A self-taught artist, Lucas Century was born in Newark, New Jersey in 1955. While he studied business at Case Western Reserve University, Cleveland, his primary interest as a young student was art, specifically photography. He explored the intricate patterns he saw in nature, such as tree bark and the rippling of moving water. His attraction to etching began at the same time when he got a job engraving people’s names on snow skis at a resort shop. A window washing job in the 70s led to an epiphany. Pulling a squeegee across a pane of glass, Luc saw his reflection and became intrigued with the idea of how to transfer graphic images and color onto glass. This investigation led to four years of experimentation with acid etching and other techniques after which Century developed and perfected an innovative photographic process for creating stencils that could be used in sand-blast engraving. The erosion of the surface technique became a metaphor for the “sands of time”; what the natural elements would do over millennia, but faster. Century’s considerable spiritual energy and heartfelt intent is always at play. 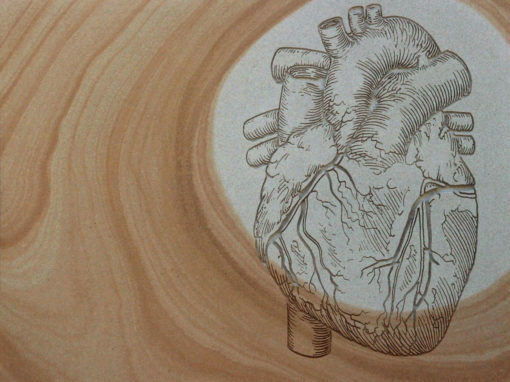 His love of nature, the aesthetic beauty that lies within, is permanently embedded in his work. A fulltime artist, Century has maintained a home and studio on Sanibel Island for the 28 years, living and working within a natural sanctuary of lush, subtropical vegetation. 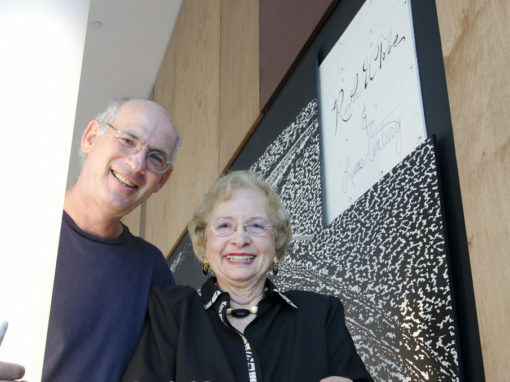 He and his illustrator wife, Dee Serage-Century, often work together as an artist team on projects. 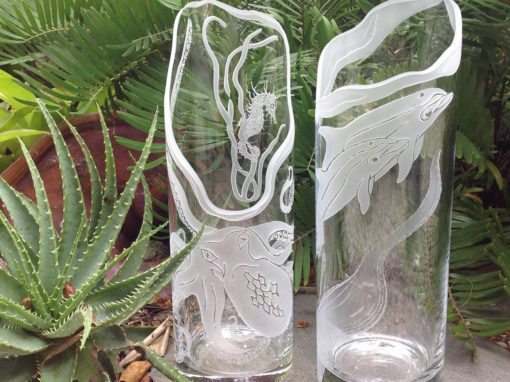 This week’s Q & A feature is renowned island glass artist Luc Century. Read on to find out more about his philosophies on life and art, his experience working on the Vietnam Veterans Memorial Wall in Washington, DC, and his fondness for tapioca pudding! Where did you grow up? I like to say I was both raised in Cleveland Heights, Ohio and grew up on Sanibel. Cleveland has a wonderful cultural community that surrounds University Circle where museums, galleries and performing art halls abound. I was constantly exposed to this pocket of creative people who radiated the arts and my fondest memories of my childhood included exploring the avenues of people and venues that Cleveland had to offer. I went through the public education system in Cleveland Heights and I think I timed it just right. Throughout my junior high and high school years, there was a humanistic curriculum program offered in a flexible education format that was unique to the times (late sixties and early seventies). I had the freedom to choose from a wide variety of subject matter or to study whatever appealed to me. I enjoyed devising my own style, which sometimes took me far and wide, like studying African Culture or learning about alternative photographic techniques. So being in that structure (or lack of) was very influential to my formative years. I think this is where I began to believe in creating a destiny outside the box for myself. Sanibel was to be a one week vacation from my work on the Vietnam Memorial in Washington, DC in 1983. Either this has turned into the longest vacation on record or the finest Utopian experience I could have imagined. During that first week on Sanibel, I met my wife Dee on the dance floor at the Crow’s Nest at ‘Tween Waters Inn. Basically, that was it right then and there. I saw my whole life unveil before me; a wonderful gal, a sacred island, a little cottage on the east end by the Lighthouse where I could live and work etching my life into eternity. What’s your family like? 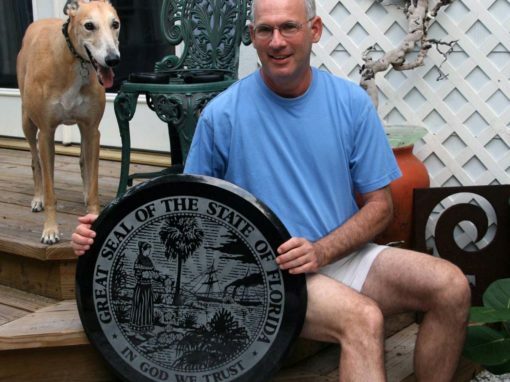 My family on Sanibel is comprised of Dee, our Greyhound Gracie and all the birds, gopher tortoises, rabbits, lizard, ants, snakes, butterflies and dolphins that share our space. I know and love many human companions on Sanibel too and really do see them as an extended version of family because we really are quite tribal on these Islands. I have a stepdaughter, Shannon, who lives in Tennessee and two grandsons who live there as well. I have a sister, Janet, who has a wonderful son Peter and they live around my delightful folks Bernie and Evie who still reside in the same house I was raised in. When did you first discover that you had an interest — and talent — for art? Back in ninth grade, I had a couple of friends who lived down the street who were getting into photography and I had this huge urge to be a part of that. It fascinated me to develop film and print in the darkroom with chemistry, light, lenses and, best of all, red safe lights. To go from what the eye captured on film and then be able to translate it on to photographic paper…well, it just couldn’t get any better than that. It was magical. I remember projecting imagery through the enlarger and spending countless hours cropping and composing my evenings away. These exercises instilled within me a photographer’s eye and a love for this fascinating art form that consequently began a career based around photographic methods. How would you describe your aesthetic and creative philosophies, respectively? I like expressing the essence of things. There is a soulful resonance within life forms and learning to manifest its simplest version is a challenge. I enjoy reworking materials until a balance is reached and discovering yourself through the entire process of unfolding is as much the beauty as the end product. What inspires you, both in your art and in your life? In general, I would say that I’m just basically plain inspired and I really am not sure where it directly comes from. Specifically, I find that co-creating with another person can be very inspirational and, most remarkably, when the collaborative spirit is pure. I find that exercise, sunshine and being outdoors for awhile can re-focus my creative self to head back into the studio and produce joyfully. What are some of your most memorable projects/pieces of work? Many of my works stand out as fond experiences, but one in particular is worth noting. Dee and I took a trip to Costa Rica around 1990 and I took a photo of a silhouette of a tree fern. We were in a cloud forest way up in the mountains and something about that entire moment — with the mist, clouds, exotic bell birds ringing in our ears, hummingbirds and holler monkeys — was able to fully translate itself into a glass piece I crafted soon after I came back. I would say all those elements came over me and I felt one in the recreation of that moment when making the glasswork. I was able to bring that special experience in time from a land far away, back through my heart, and see it once again in a body of work that connected it all together. 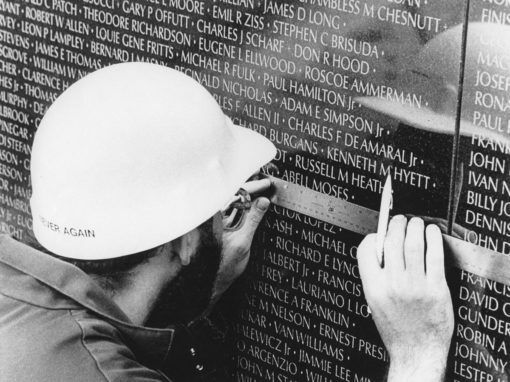 What was it like working on the Vietnam War Memorial Wall? It was, as you can imagine, an amazing time of my life. I called Maya Linn after I read about her design acceptance as I thought I could possibly help with etching the 58,000 names into the black granite. She referred me to the project director and he basically fell out of his chair when I called because they had just decided there was no feasible way to have etched the names efficiently or effectively by the planned dedication. Long story short, I was commissioned in very quickly after I successfully demonstrated my etching method and I set up a system with a large glass fabricator who could handle the massive panels. We accomplished everything in time and the Veterans were able to finally have their homecoming and an amazing memorial for the nation to stand by and heal from. I was then asked to devise a system to add names to the memorial after it was erected so I accomplished that as well and I personally added the first 100 names, bringing the total to over 58,000. Emotionally, it was very difficult being at the Wall adding names as relatives and friends visited the memorial. I had to stay focused on my work as folks were breaking down around me seeing their loved ones names. There was lots of media coverage, distractions — as in weather climate changes — and not to mention the pressure in absolutely etching the names as perfectly as possible. The techniques I employed for use on the Wall I have refined over the past 25 plus years and the work I do today utilizes improved versions of what I knew back then. I am very grateful to have been involved in the making of the Washington, DC and Fort Myers Vietnam Veterans Memorial and I hope we all have an opportunity to visit them and experience their reflective messages they offer. What do you like to do in your spare time? Nothing like swinging a tennis racquet from time to time and I really enjoy stretching it out on the bike along Sanibel’s bike paths. Playing with our 10-year-old Gracie the Greyhound down on the beach is an evening ritual I look forward to everyday. About twice a year, we find ourselves enjoying our retreat on our land outside of Gainesville. There we find nourishment under the massive live oak trees and refresh ourselves by swimming and floating in the magical springs on North Florida. What’s something people might be surprised to learn about you? There is something about tapioca pudding that knocks my socks off — the good kind with large pearls that takes an hour or so of stirring to make. If you could sit down and have dinner with anyone, living or dead, who would it be and why? Abraham Lincoln. He was such an important force in our destiny as a country. I’d just like to hear his voice and story. What are you working on now? I’m currently working on a large porcelain tile mural for the Bower School of Music at Florida Gulf Coast University. It’s a massive undertaking, as it is comprised of 75 2 ft. x 2 ft. tiles and fills out a 10 ft. x 30 ft. area above the new dazzling recital hall within the building. I’m currently installing it and anticipating it’s completion within the next couple of weeks. Anything you’d like to add? Sanibel and Captiva are such wonderful places and I would like to thank all the equally special service people who keep our community running. From City employees to fire and rescue, police, sanitation, landscapers, service technicians, health offices, grocery folks, taxi drivers, carpenters ,shop clerks, etc. Happy Holidays — especially to you — because you’re the ones who do the daily grind and travel far and wide to support your families with love.